The view on Perry West construction in January of 2002. 173 Perry Street building in January of 2002. See construction pictures of Perry West (here in June of 2001). Thanks for the photos. *I like these buildings a lot more then I thought I would. * I think if they used highly reflective "mirror" glass, it would have ruined it, but the clear glass makes it fit in better. 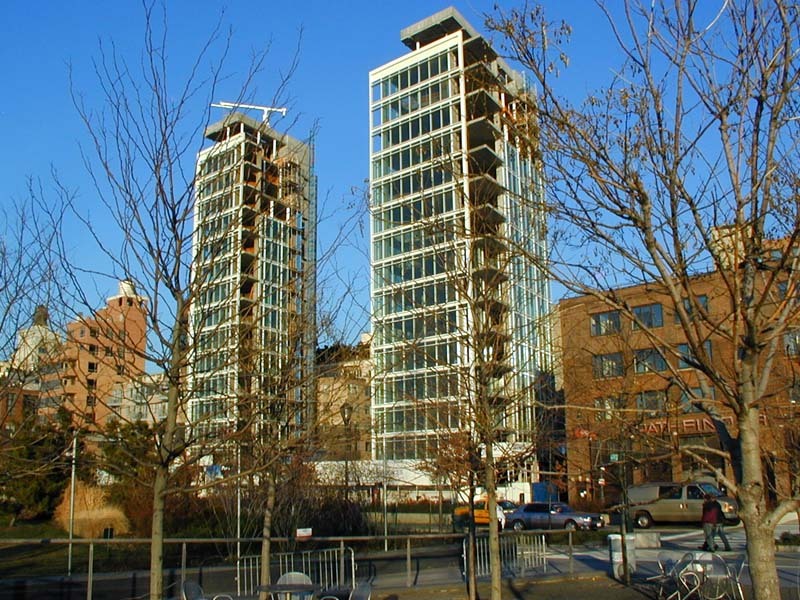 The view of the Perry West condominiums from the West Side Highway in March of 2002. 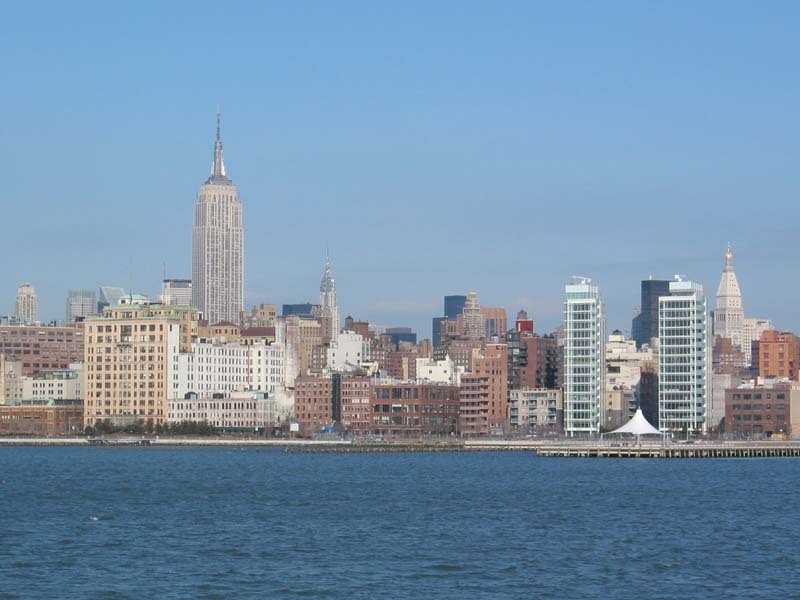 The view of the Empire State Building and Perry West from Battery Park in March of 2002. Those are some great looking apartments. Nicole Kidman has unloaded her Pacific Palisades home for a price just shy of $11 million - which should come in handy to help pay for her splashy West Village apartment. "She's been to the Perry St. building quite a bit lately with her decorators," says our spy. Kidman bought the apartment earlier this year for around $8 million. JOGGERS may have been the first to know — or to suspect. Roy Liebenthal, a 39-year-old restaurateur, was a jogger along West Street on the lower West Side in the 1980's. Even then, he says, as he ran past dilapidated piers and small commercial and industrial buildings he foresaw a glorious future for residential development on the eastern side of the street. Glorious may be too extravagant a term to apply to the pockets of residential growth that now dot a long stretch of the eastern edge of West Street. But there is no denying growth itself. Buildings are increasingly emerging that offer buyers and renters exceptional views directly across West Street over the city's waterfront piers and the Hudson River to the New Jersey shore. Conversions of loft buildings, and more recently new construction, are occurring not merely south of Canal Street as a reflection of the growth of Battery Park City and city financial incentives, but also in the long stretch roughly from Canal Street to 14th Street. The first major pocket of gut conversions and new construction emerged in the 90's with the Rockrose Development Corporation's buildings in the meat market district around Gansevoort Street. New pockets have since sprung up in the West Village as residential growth expands from Greenwich Village. 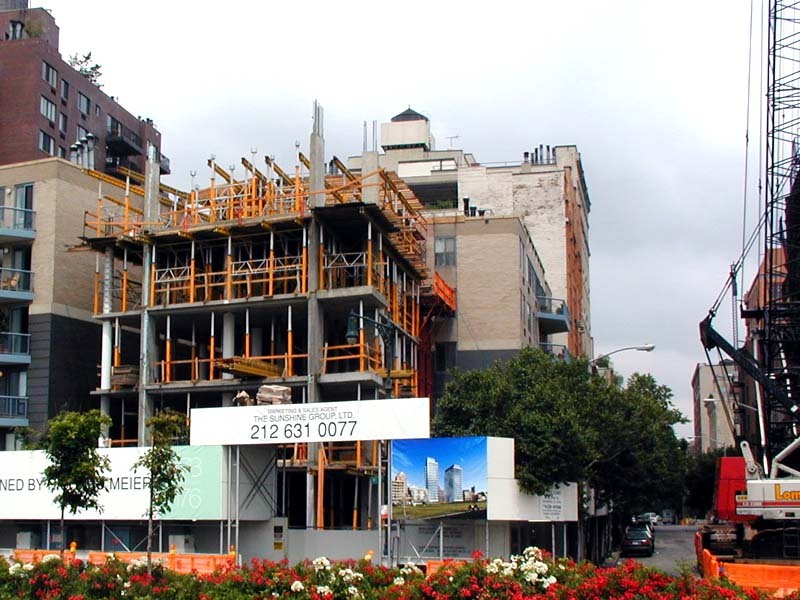 More projects are in prospect farther south in the western reaches of the Hudson Square and TriBeCa neighborhoods. Typically, the front entrances are on side streets, and one side of the building abuts West Street. 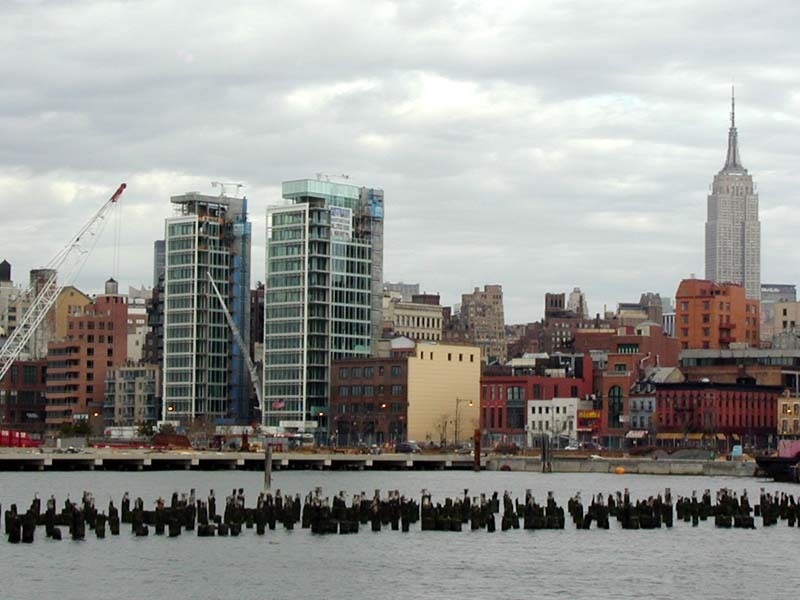 The stretch more or less coincides with construction work at Hudson River Park, which will provide walking-distance recreational attractions for West Village residents when the reconstruction of three riverfront piers is completed in the spring. The Hudson River Park Trust has already completed a bikeway and walkway along the length of the park, from the Battery to 59th Street. In the Village area, the walkway runs along the west side of West Street. The trust also maintains the landscaped median on West Street that eases pedestrian street crossing on the busy, and wide, avenue. 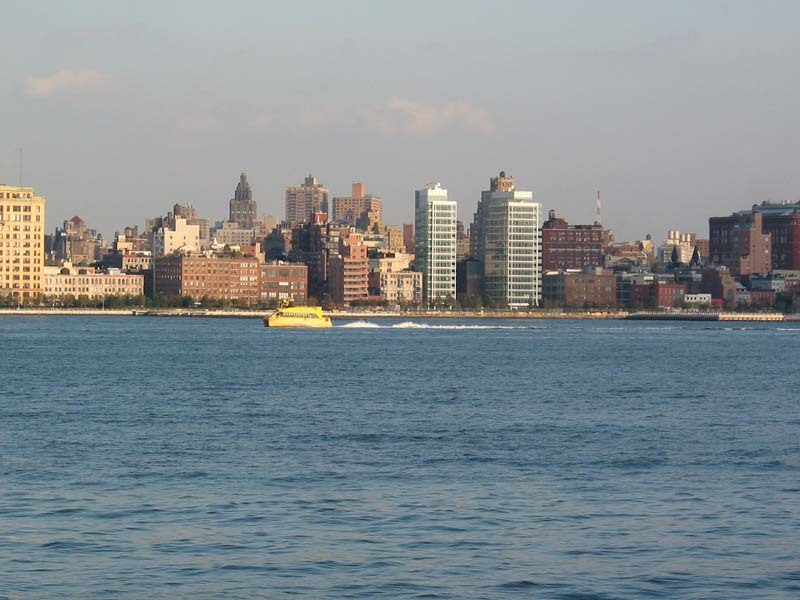 "The West Side Highway has become Hudson River Boulevard," said Mr. Liebenthal. He himself bought unfinished loft space in the building at 495 West Street, between Jane Street and West 12th Street in the West Village, three years ago. He has a direct view of the Hudson River and the New Jersey shore from his fourth-floor window. "You see cruise ships; you see jet skiing; you see powerboat races, kayakers, swimmers, airplanes, helicopters," he said. "It's just a beautiful moving picture." One building will be a 14-story condominium on Morton Street. Another is to be a six-story structure on Morton Street with six town houses at the base and loft apartments above. The third will be a seven-story rental on Washington Street. Completion is scheduled for the spring of 2004. Since the side streets and inland avenues have a more residential character than West Street, all the entrances to these buildings will be on Morton Street or Washington Street. But one leg of the 147-unit L-shaped condominium will border West Street and provide 52 apartments with head-on river views. About 12,000 square feet of commercial space will be provided at street level, a third of it on West Street. The developer is the J. D. Carlisle Development Corporation. Costas Kondylis &amp; Partners is the architect. Many of the tenants who currently live on West Street are in a Rockrose project in the area from Gansevoort to West 12th Street between Washington and West Streets. These blocks were completed in the 90's with 900 apartments, which include 800 rentals in the buildings known as West Coast apartments. "I rented an apartment trying to get as close to the river in the West Village as I could," said Andrew Stern, 31, who took a West Coast apartment on Horatio Street in October. He has a view of the river from his fifth-floor studio. He said he uses the bicycle and walking path along West Street to go north to the Chelsea Piers sports complex on the river in western Chelsea for recreation and to go south to pick up his car at the Pier 40 garage near West Houston Street. "It's very convenient," he said. This year two new buildings sprang up in the West Village that enhance the residential look of West Street. These are glassy 15-story condominium towers that the developer Richard Born and his partner, the architect Richard Meier, built at 173 and 176 Perry Street, facing each other at the western edge of Perry. Mr. Meier, the architect for such well-known buildings as the Getty Center in Los Angeles and the Museum of Contemporary Art in Barcelona, was also the architect for Westbeth, the 384-unit artists' housing development on the block between Bethune and Bank Streets and West and Washington Streets. Built in 1970, it was the first new residential project in the modern era to reach as far as West Street. THE Perry Street condominium's raw space was sold out through the Sunshine Group over a six-month period in the latter part of last year, Mr. Born said. Toward the end of the sales period, prices reached $2,000 a square foot, he said, comparable to what buyers might pay for finished space on Park Avenue. The average price was $1,480 a square foot. Four buyers relinquished their contracts to the sponsor during the sales period at a profit as high as 50 percent, Mr. Born said. By last summer, sales had closed on all 28 residential floors. There were 22 buyers, some of them taking more than one floor to create duplexes or triplexes. Most new owners are currently building out their space or making plans to do so, brokers say. Occupancy is expected to start early next year. A few buyers are trying to resell, the brokers said, among them Martha Stewart, who closed on a $6-million 3,000-square-foot duplex penthouse in September. Other celebrity buyers include Calvin Klein, Nicole Kidman and William Joy, the founder of Sun Microsystems. "We could have built a short, squat building as of right, of which there are dozens in the area, and walked away and made a profit," Mr. Born said. "But we had a vision of something special, looking out on the river, making the most of the light and a 360-degree view." It was expensive to do this. There are more square feet of glass curtain wall in the building than of interior floor area. The curtain wall alone cost more than $100 a square foot, Mr. Born said. One consequence of the extraordinary level that prices reached in the Perry Street condominium is that land prices for nearby property suitable for development have risen as well. Just south of the Perry Street site, bidding reportedly reached $250 a developable square foot for such a parcel — 12,000 square feet on West Street occupied by Pathfinder Press. "They were looking for $300 a foot," or $23.4 million, to build 78,000 gross square feet of building area, said Charles Blaichman, a co-developer of the Perry Street condominium. "That hasn't been paid anywhere. I think out-of-towners jacked up the price." Unsuccessful bidders reported that a sales contract was signed for $20 million, or more than $250 for each square foot that can be built, with an unidentified buyer, but parties to the sale declined to discuss it. The value of the Pathfinder Press property reflects in part the fact that demolition and new construction of a sizable building could begin fairly promptly, without zoning or other complications, developers say. This is rarely the case along West Street. Modest commercial and industrial establishments of yesterday operate on some blocks, and they will not disappear overnight. For the most part, existing zoning is inconsistent, allowing only light manufacturing or commercial activity on some blocks and residential construction as well on others. Residential builders frequently must seek variances from the Board of Standards and Appeals in order to build. In the meat market district, Rockrose spent five years getting variances for the four of its nine buildings that needed them. Currently, the developer Stephen Touhey is trying for a variance to build 175,000 square feet of new commercial and residential space on land with West Street frontage off West 13th Street, the site of the former Nebraska Meat Market at 848 Washington Street. At a hearing last November, the application provoked substantial local opposition. Designed by the Paris-based architect Jean Nouvel, the plan called for 34 residential spaces as well as commercial and office space in three buildings. One was to be a 32-story residential tower with a gray corrugated-steel facade intended to reflect the district's industrial tradition. Subsequently, Mr. Touhey said, he considered building an as-of-right hotel. But that approach has been rejected, and now he plans to be back before the board next month with a revised version of the original plan. In this version an eight-story mixed-use building close to the active meatpacking buildings has been eliminated, leaving the project with no residential component on Washington Street. The interior of the tower has been altered to provide additional square footage by eliminating some double-height ceilings. But the revision may not end opposition. A number of residents and community groups oppose all new high-rise development in the district. Last week the Albany-based Preservation League of New York, at a press conference joined by the Greenwich Village Society for Historic Preservation, announced inclusion of the Gansevoort Market area on its annual listing of seven of the most threatened historic places in the state. Other projects with West Street frontages are in varying stages of planning. At one site, Africa Israel Investments Ltd., a development firm based in Yahud, a town outside of Tel Aviv, owns two connected parcels at West Street and Laight Street, three blocks south of Canal Street at the western fringe of TriBeCa. Asi Cymbal, the American representative of the company, said the intention is to build a 69-unit condominium in two buildings, one of 13 stories at West and Laight and the other of six stories at Washington and Vestry Streets, connected by an internal corridor. There would be first-floor commercial space and below-ground parking. The architect is Ismael Leyva of Manhattan, with Tsao &amp; McKown, also of Manhattan, as the design architect. Not far away, the Jack Parker Company has leased a 36,000-square-foot site from Ponte Equities, the investment arm of the younger generation of the Ponte restaurant family, at West, Watts and Washington Streets. Jack Parker has not disclosed its plans either, but the company has a long history of development and construction both in the city and in Westchester. A parking lot and garage occupy its site now, and a variance or zoning change would be needed for residential development. At Morton Square, the Carlisle Development Corporation was granted a variance after a 14-month process. Representatives of West Village Houses, a middle-income project across the street, protested that the development would lead to displacement of renters in the vicinity through a rise in property values and rents. That argument did not prevail, but the developer did reduce the height of the condominium from 17 stories to 14 and provided a setback at the eighth floor, a recommendation of the Department of City Planning. Sales are to begin in February. EVEN if zoning allows residential construction, the difficulties of site assemblage impede new development. The owner of many crucially situated underdeveloped parcels in the West Village, the estate of William Gottlieb, has been unwilling to sell any property, developers say. The properties are now controlled by Molly Bender, Mr. Gottlieb's sister. Efforts to reach Ms. Bender by telephone failed. The Department of City Planning recognized the pressures of growth four years ago in a rezoning action affecting western Chelsea. As part of a broader rezoning, mixed residential and commercial zones were extended along 23rd Street from 10th Avenue to 11th Avenue. Previously, no residential development had been allowed as far west as 11th Avenue. Now the department is close to reaching the public-review stage for a comprehensive plan for growth in Hudson Square, defined as the area generally bounded by Canal Street and Morton and Barrow Streets and by the Avenue of the Americas and West Street. It is a mixed-use area with recent commercial as well as residential growth. The plan will attempt to accommodate both growth and preservation, said Richard Barth, executive director of the department. In the meat market district, where the city-owned Gansevoort Market houses about a dozen meat wholesalers and there has been commercial and industrial as well as residential construction, the department has been content to let growth evolve under the existing manufacturing zoning. The number of meat-related businesses has diminished over two decades, the planners say, but those that remain still constitute a major presence. Many of them service high-end restaurants and food purveyors. Much recent renovation or new construction has been as-of-right and heavily commercial, with an emphasis on retailing. The largest recent new-construction project is an unusual concoction at 415 West 13th Street — 60,000 square feet of space on eight floors rising inconspicuously from the rear of the preserved facade of a three-story building. Only from a distance can the glazed black-brick facade of the set-back tower be seen. "There's a market there for companies in the fashion and media industries," said Bruce D. Sinder, president of Sinvin Realty, the agent for the property. The architect was Selldorf Architects of Manhattan. Elsewhere near West Street, zoning change is under consideration. "We would like development to proceed pursuant to a plan, not by Board of Standards and Appeals variance," Mr. Barth said. "We're looking at the area from 15th or 16th Street to about 23rd Street. The challenge is, how do you allow residential growth without undermining the arts district that has emerged in that area." Art galleries have multiplied in the area west of 10th Avenue roughly between 16th and 25th Streets. Robert P. Balachandran faces a different challenge. Mr. Balachandran is president of the Hudson River Park Trust, created by state legislation in 1998 to design, construct and maintain a 550-acre five-mile park along the Hudson from Battery Park to 59th Street. The "parkland" includes 13 public piers and 400 acres of land under water. The park was merely a hope for the future when residential development along West Street got under way in the 90's. The first new-construction project was 495 West Street, nine loft apartments in a 11-story building between Jane and West 12th Street. The developer was Cary Tamarkin. The project sold out in 1997 at an average price of about $700 a square foot, Mr. Tamarkin said. "It was the record on West Street at the time," he said. "Now the question is whether the Richard Meier project was an aberration at the prices it achieved. I'm not sure that that was a repeatable formula." West Street is relatively distant from mass transportation, and traffic noise is often intense, Marlene Hartstein, a sales broker with Ashforth Warburg, noted. "But there are people who like less congested areas," she said. "If they have cars or they like to walk along the river, it's an ideal location." These are advantages that impressed Joe Castaldo, owner of the Style Council, a textile design studio, who was an early buyer in the Meier-designed Perry Street condominium. Mr. Castaldo had aspirations as a developer himself a few years ago, and with a partner, Tom Cody, he had purchased a vacant garage on Perry Street next to the property Mr. Born and Mr. Meier bought. Mr. Castaldo's plan had been to rebuild the garage building for residential use and then keep one floor for his own apartment. But on the very day he closed, he said, his neighbors' project was announced in the press. Looking south on West Street toward pair of new buildings designed by Richard Meier on Perry Street. February 13, 2003 -- MARTHA Stewart may be close to unloading her West Village apartment - and the buyer looks like New York Mets owner Fred Wilpon. 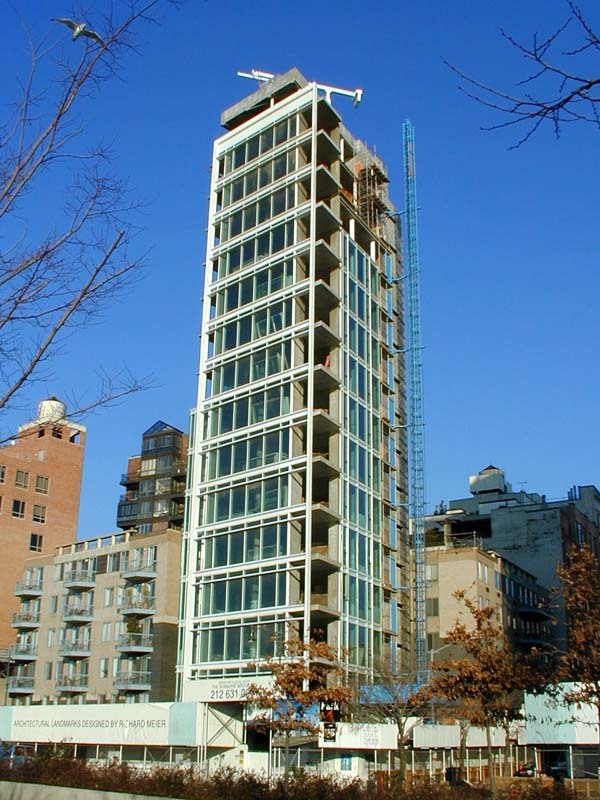 Sources say the CEO of the cellar-dwelling team is bidding on the Domestic Diva's duplex at 173-176 Perry St.
One of the best-known unfinished (and unoccupied) apartments in New York City, Stewart's 4,000-square-foot raw duplex in the Richard Meier-designed building may have been an impulse buy, according to one report. A broker familiar with the apartment said Martha wanted to sell not because of her legal problems but because the place was too small. "It's very narrow," said the broker, noting that once stairs are installed, the living space would be cut down to 3,000 square feet. Most believe the apartment will fetch somewhere around $6 million. Actress Nicole Kidman plunked down more than $8 million for her 4,000-square-foot condo in the West Village building, whose residents also include Calvin Klein, Rita Schrager (ex-wife of hotelier Ian), chef Jean-Georges Vongerichten and other high-profile types. The sleek, 15-story, 28-unit building with two towers will feature a Jean-Georges-operated restaurant, a spa and gym, a 24-hour concierge and beefed-up security. Klein bought the 12,000-square-foot triplex penthouse in the south tower - one floor above Kidman - for $14 million back in 2000, before developers Richard Born and Ira Drukier had even broken ground. Stewart's place, which is in the north tower, on eye level with Klein's penthouse, has spectacular views of both the Hudson River and the Manhattan skyline. Any reason as to why these buildings have attracted so many celebrities? Perhaps only celebrity can afford an apartment in the $8 to 14 million range. I guess b/c it's a prominent location, downtown, entire wall windows. Plus it's crazy prices are for RAW SPACE. *So all the picky celebs could say they spent a fortune than brought in some famous designer to furnish it and spend another couple mil. Ahhh... I'm doing something wrong. Empire State Building, Chrysler Building and Perry West condominiums. LATELY, Richard Meier has been reclaiming the rare quality that he started out with. I mean the quality of radiance: the Apollonian virtues of clarity, order, simplicity and light. Since 1997, when he finally finished work on the Getty Center in Los Angeles, Mr. Meier has been brightening up his repertory with exquisite structures on a smaller scale. The architect's aesthetic approach has not changed. The times have. So has the historical context. A formal vocabulary that once seemed constrained by the dogmas of the International Style now stands for freedom from the woolier rhetoric of the postmodern 1980's. Nowhere does this shift come into clearer focus than at 173 and 176 Perry Street, two residential buildings Mr. Meier recently completed on the far west side of Greenwich Village. The glass towers, which face each other across the narrow village street, are as handsome to look at as the Hudson River views they overlook from their floor-to-ceiling windows. They catch the light reflected from the water like a pair of frozen fountains. Early this year, even on cold winter days, sidewalk superintendents could be seen stomping about outside the buildings, as if there were something thrillingly novel about construction in New York. Perhaps some of them were scouting out vantage points for peeping at the boldface names who have signed up to move into the glamorous cages. Most, I suspect, were feasting their eyes on architecture, a genuine novelty to behold rising at any construction site in a town where the art of building still counts in some circles as delinquent behavior. We like architects more than architecture here. In the last few years, several residential high-rises by star designers have gone up in Manhattan. There is little to say about them apart from reciting their names. On Perry Street, by contrast, Mr. Meier has fashioned work for the historical imagination to feed on. Apart from their intrinsic formal qualities, the buildings reveal how a city goes about constructing a context of time. From the West Side Highway, the towers create a neo-Classical impression. A modern glass version of an 18th-century European gateway: that's the initial effect. But the symmetrical image is deceptive. In plan, the south tower is more than double the size of its uptown twin. 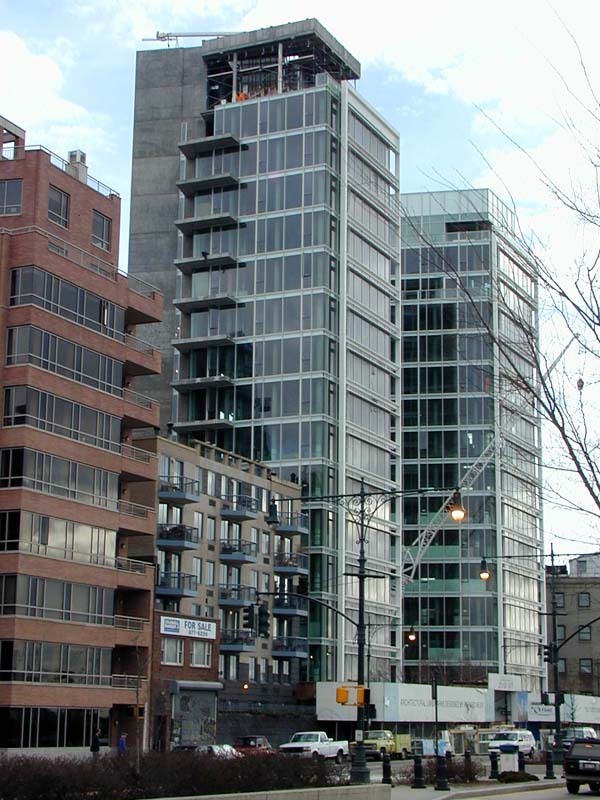 This imbalance recalls the two pairs of asymmetrically sited residential high-rises designed by Mies van der Rohe for Lake Shore Drive in Chicago. So does the waterfront location. The Perry Street towers are 15 stories tall, with one apartment per floor. Mr. Meier's spare geometric forms knit these perpendiculars into a harmonious composition. The result is two sets of stacked urban stages, each with excellent sightlines: a multiplex for exhibitionists and the voyeurs who adore them. The structure is concrete, with curtain walls of glass and painted metal. The division is expressed on the exterior by fire stairs enclosed within gray concrete cores. In glass buildings, floor slabs perform the expressive function formerly taken by walls. Viewed through the glass curtain wall, the empty volumes between floors and ceilings become formal elements. So do the curtains, blinds and lighting installed by tenants. The lightness of the floor slabs and structural columns is further refined by the pristine delicacy of the exterior's white metal frames. Shadow boxes, mullions and railings appear to stretch the glass skin taut against the envelope formed by the slabs. Balconies with tinted blue glass side panels extend the platforms beyond the skin. The south facades mirror each other across Perry Street, uniting the double block. It strikes me that the towers are a pair of Hitchcock blondes. The white metal framework of their facades is so crisp and pure that the towers could be two twins dressed for First Communion. But inside, fireworks: two towers full of racy Rear Windows. I do believe that's Miss Torso up there, practicing jazz dance right now. Soon to be joined by Nicole Kidman, Calvin Klein, Jean-Georges Vongerichten and I forget the rest. How will they handle window treatments? The world anxiously awaits. Or, to state the matter more clinically, the subtext of these buildings is the friction between what Beatriz Colomina, a senior professor at Princeton's School of Architecture, has called privacy and publicity: the conflicting desires for refuge and exposure. This is a dominant theme throughout contemporary architecture today. Mr. Meier's buildings may lack the emotional risk-taking we encounter in work by Frank Gehry or Wolf Prix. But their formal understatement heightens the underlying tension between a viewer's inner and outer worlds. Glass, metal, natural light, white surfaces, orthogonal geometry, solid and void: this basic vocabulary can be found in any number of 20th-century "machine age" buildings. Mr. Meier's formal vocabulary does not, in itself, account for the bold impression the buildings make. Nor can it be explained by some imaginary pendulum shift in public taste from "history" back to "modernity." No one with any taste ever fell for that ahistorical piece of postmodern spin. On Perry Street, we witness the complex display of actual history at work. We witness conflict, that is to say: the formation of urban context through the contest of ideas. One of those contests got under way not far from here more than 40 years ago with the 1961 publication of Jane Jacobs's book "The Death and Life of Great American Cities." The book was one of 20th-century architecture's most traumatic events. Its impact is still felt in cities across the land. Greenwich Village was the crucible for some the book's most influential ideas. Ms. Jacobs's vision of the ideal city was inspired by her own block of nearby Hudson Street. West Village Houses, a low-rise complex designed by Perkins &amp; Will in the 1970's a few blocks south, was New York City's first attempt to apply her ideas to planning. Ms. Jacobs's book was an attack on modern city planning, not on modern architecture per se. Its impact on architecture was devastating nonetheless. One of the modern movement's central tenets was that architecture and planning were indivisible. This fusion allowed modernists to regard their cause as progressive in social as well as artistic terms. It fell to Ms. Jacobs to expose the limits of this claim. The Radiant City, Le Corbusier's 1925 vision of a city of high-rise towers separated from each other by open parkland, was the central target of her critique. After World War II, this plan became a standard template for urban renewal projects around the country. Its application enabled American architects to perpetuate the self-image of social conscience. As Ms. Jacobs saw it, modern city plans were not true social undertakings. They were works of art writ large. The Radiant City was a piece of graphic design or sculpture, an aesthetic exercise with little basis in the practical realities of urban life. "A city cannot be a work of art," Ms. Jacobs insisted: this was her book's single italicized idea. In hindsight, it's clear that the crisis provoked by Ms. Jacobs went far deeper than a conflict over the merits and defects of modern architecture. It involved the crumbling of historicism: the 19th-century belief that each epoch should produce its own distinctive style. Modern architects may have rejected the use of period styles, but they clung to the basic historicist creed. An industrial society should have buildings to match. By the early 1960's, this idea was in retreat. The historical inevitability of modernism, if not modern architecture per se, was no longer credible. A modern society could live happily without being herded into towers in a park. Ms. Jacobs had a sound point to make: society and art represent different systems of meaning and value. Still, one of architecture's major functions is to negotiate changing relationships between the two. If the concept of "place" has any meaning, it lies in the vigor with which social and artistic values confront one another in urban space. Art, moreover, is one of the best techniques we have for apprehending urban complexity. De Kooning, Tinguely, Rauschenberg, Warhol, Twyla Tharp and Spike Lee have variously shown us what kind of artworks the modern city wants to be, or already is. For more than three decades, contemporary artists have held up mirrors to the pluralism of urban life. Yet if we look back at New York's architectural record during the same period, it is fair to conclude that the skyline has suffered more from the absence of art than from the presence of it. Ms. Jacobs can't be faulted for this. Like Le Corbusier, she was a polemicist who knew how to score points that needed to be made at a particular time. Forty years ago, when she was scoring points against art, she can't have been hoping for the tyranny of petit bourgeois taste that holds New York building and planning in its philistine grip. But look what we ended up with: a city where architecture is routinely denigrated as weird, elitist or avant-garde. Some may dismiss the Perry Street buildings for not being weird or cutting-edge enough. Compared with Mr. Gehry, Rem Koolhaas or Zaha Hadid, Mr. Meier is indeed a conservative architect. One of the most valuable functions performed by the Perry Street buildings, in fact, is to reinforce the conservative edge of contemporary architecture's range. Beyond that line lie postmodernism, contextualism and New Urbanism. Since these movements presented themselves as anti-architecture, what was the point in conferring architectural status upon them? By now, it should be obvious that these "isms" have been anti-urban, too. They have obstructed efforts in New York and other American cities to face the challenges of globalization and its impact on urban centers. Last year, for example, New Urbanists almost succeeded in foisting a retro theme park on ground zero. The process of planning the future of the World Trade Center site was irreparably damaged by the energy wasted in that preposterous effort. A Hegelian might say that Mr. Meier's new buildings are the synthesis of Le Corbusier and Ms. Jacobs. The Radiant City has been scaled down to two towers facing each other across a traditional city street. This assessment would not, however, account for the unique quality of radiance Mr. Meier has achieved in this design. For that, we have to look at the architect's unique relationship to urban history. WHAT distinguishes Mr. Meier from previous generations of modernists is a shift in ideology. Le Corbusier and Mies van der Rohe were historicists. They believed that the machine age demanded expression in a particular formal vocabulary. So did second-generation modernists like Gordon Bunshaft, the architect of the Lever House on Park Avenue. Richard Meier is a formalist. His work reflects the ideology that prevailed in the 1950's and 60's, when the Museum of Modern Art was the supreme arbiter of urbane taste. Mr. Meier may harbor historicist sympathies for all I know. Many architects couldn't get up in the morning if they weren't convinced that their way is the best way for their time. As a formalist, however, Mr. Meier seeks less to express history than to transcend it: to attain a level of geometric abstraction high above the fray. Mr. Meier makes sculptures in addition to buildings. A group of them will be on display this fall at the High Museum of Art in Atlanta, designed by Mr. Meier, as part of an anniversary observation. I would like to see it, to test a theory: the primary function of these artworks is to deceive Mr. Meier into thinking that his buildings are not artworks, too. Earlier generations of modernists rarely gave themselves permission to reach for the degree of abstraction Mr. Meier has maintained throughout his career. Mr. Meier's trademark white metal panels, for instance, are a far cry from Le Corbusier's raw concrete walls. Le Corbusier developed the potential of new materials and methods. Mr. Meier exploits the capacity of glass to dissolve materiality altogether. On Perry Street, the Corbusian brise-soleil, a concrete sunscreen device for use in tropical climes, has been etherealized into flat metal filigree on the western facades. Formalism led to a bizarre blurring of the categories of art and architecture. With artists like Frank Stella, Donald Judd, Tony Smith, Sol LeWitt and Dan Flavin, painting and sculpture became almost indistinguishable from design. With architects like Mr. Meier, Peter Eisenman, Mr. Gehry and Harry Cobb, buildings took on the identity of abstract sculpture. Increasingly, the distinctions between the fields came to depend on context: the environments in which objects are presented for our contemplation. We know that the Perry Street buildings are architecture because they are located on a street and are scaled accordingly. But if we look through the glass walls into the spaces behind them, a very different kind of environment is revealed. It is industrial loft space, the neutral but aesthetically charged environment that became standard for art galleries by the early 1970's. Rather than modernist hymns to machine technology, the towers represent the apotheosis of what the art critic Brian Doherty called "the white cube." That is where their radiance comes from. As Mr. Doherty pointed out in a seminal Artforum essay in 1976, the aestheticized void of the gallery was a major part of the artistic experience. Surely that's one of the major reasons for the success of the Dia Foundation's new installations in Beacon, N.Y. Warhol's "shadow" paintings, for example, are a function of the industrial space required to show them. Loft spaces are platforms. They take the place of traditional pedestals. Artworks add to the atmosphere, but a pile of old tires would do nearly as well. Without the platform, the white walls, the track lighting and the volume enclosed within them, the atmosphere can't move in. In the contemporary city, loft space has acquired a new set of meanings. The reuse of old factories by artists, galleries and the industries that support them epitomizes the current conversion of entire cities from manufacturing to cultural production. Mr. Meier's buildings are monuments to this transformation. The space has become the art. The people inside it, too. Call this workers' housing for a city of culture workers. A place where an overabundance of energy goes into the construction of the self.